At Quiescence Wellbeing we offer a complete range of Beauty Treatments carefully designed and selected to replenish, relax, tone and revive; and of course to spoil and indulge! Discover a whole array of facial massage treatments, exfoliation, aromatherapy, luxury manicures and pedicures. Our pamper sessions are all about you, relax and enjoy! 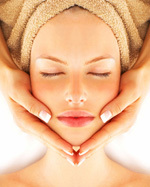 This facial is tailor made to suit individual requirements. A unique sequence of massage movements designed to improve skin tone, soften fine lines, hydrate and replenish. To include shoulder, neck and scalp massage. A specific blend of carefully selected essentials oils for a truly unique facial. To include shoulder, neck, hand and arm massage. During consultation I will advise you on the oils to choose for your facial. Why have just a manicure, when you can have the Full Monty? Pamper yourself! Or have some friends around for a pamper party and enjoy! Shellac is a genuine ‘hybrid’ UV gel polish which means it uses solvents in its formula like traditional polishes. The purpose of this is to have a much thinner coating, making it quicker to remove. It’ll look more like a polish than a UV gel but have the same benefits such as instant drying time and a high gloss finish.